I have a Brand New Australian Tea Towel that was supposed to be a gift but I can’t remember who to. There are also a bunch of samples & decants that need rehoming. Can you please help me out and take this lot off my hands? YAY! If you said yes, see below for how to win. Entries Close Wednesday 30th August 2017 10pm Australian EdsT and winners will be announced in a separate post. The winners will have till Wednesday 6th September 2017 to get in touch (portia underscore turbo at yahoo dot com dot au) with their address or the prize will go to someone else. Following by email, thanks again for a great giveaway!! YAY Azar. Glad they have found a loving home. i like to try the Armani Prive: Cuir Noir. Hi Portia, and thanks for the giveaway; I follow by email. I would love to try the Jicky. It’s such a monumental fragrance and I have never tried it. Hi Portia, I follow via email. I would love to try the DSH Perfumes Vanille Tonique, because Vanilla. I would like to try Vanille Tonique. Thank you for this delightful prize, I’m most eager to try the Yves Saint Laurent: vintage Y parfum. Happy email follower, Facebook and Bloglovin, too (Despina Veneti). Hello, i follow via mail and i would love to try that armani prive cuir noire. Thank you for the draw. I follow through RSS and would most like to smell vintage Cuir de Russie. Thanks for the chance! I have always wanted to try Oud Ispahan and anything by DSH, thanks for the opportunity! Email. Oud ispahan. Haven’t tried any of these goodies though. I do love tea towels also! Hi! I follow via email. I’ve been wanting to try Hedonist forever! Bogue MAAI is at the very top, followed by Oud Ispahan, then Ambergris Tincture, and the Cuir Russie, and immediately trailed by the other seven! Thank you for the giveaway! I’ve got my fingers crossed for that tea towel too! I devotedly follow by email. I follow an APJ by email. First choice is Bogue MAAI; always wanted to try it. Second is Hedonist. What a treat to win would be…and that beautiful tea towel! I follow by email. Happy to help! 🙂 I would most lime to try Hedonist, it’s been on my test list for ages! I follow via email. I think I am leaning towards Hedonist. I have not tried a perfume from Victoria yet and this seems her most popular one. I follow APJ by email and FB. JICKY!! I’ve heard so much about it and I’d love to try it! Thanks for the chance! I follow by email. I would love to try: Abdes Salaam’s Ambergris Tincture, Chanel’s Cuir de Russe, and Dior Privee’s Oud Ispahan, but actually would love to try them all. Thanks for the draw. I follow by email. I would love to try Iunx because I love so much Giacobetti’s perfumes. I follow via Facebook and eMail. I would most lime to try Oud Ispahan or Cuir Noir Giorgio Armani. …and the Abdes Salaam’s Ambergris Tincture!!!! Hello again. I follow via Facebook. If I win I’ll need time coz I’ll be away all September. Definitely Hedonist for me – its been on my Want To Try list for sooo long. Ever since I got a sample of Botrytis from another house off Luckyscent, I’ve been wanting more sweet wine frags. Oh what a great giveaway – there a quite a few I would love to try. I think the Chanel vintage Cuir de Russie would be the winner for me though – I love leather fragrances and Cuir De Russie is one of the best. I follow by email and FB and I would like try YSL Y as I am curious as to what it was about it that stands out in my memory. I follow by email. Hedonist has been on my list of scents worth trying for several years. MAAI also sonds interesting. Thanks for the generous draw! Oh good heavens, what a lovely pile of things you’re giving away! I’ve been very interested to try the Dior Privée line, so I think the Oud Ispahan is the one I’d most like to try. I’ve also been very curious about IUNX. Thanks, Portia! I follow by e-mail. Chanel, my one true love. The Ambergris Tincture would be the most intriguing for me. I follow via email. The Chanel Cuir de Russie because I love Chanel! ooh thanks for the generosity as always! 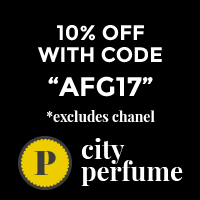 really want to try the Chanel one – have heard so much about Cuir de Russie and would be interesting to compare to the current version. Please don’t kick me out of the Perfume Lovers’ Gang, but I have to admit I’ve never smelt Jicky – quelle horreur, I know! 😉 So that’s what I’d most like to try. What a wonderful giveaway. I have wanted to try Jicky for years and have never got around to it, so that would be my choice. I follow via email.